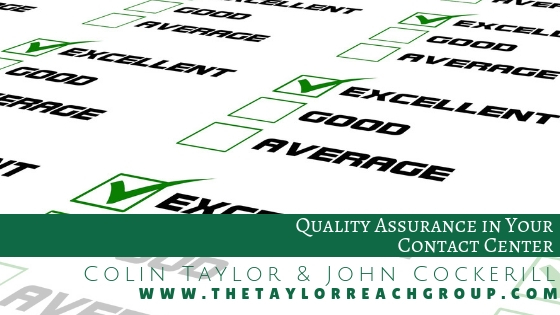 Quality Assurance in Your Contact Center | The Taylor Reach Group Inc.
Quality is a critical support function in call and contact centers. In this interview, Colin Taylor and John Cockerill discuss Quality Assurance, Compliance, outsourcing and the risks and opportunities that can be found by a closer look at your contact centers’ quality program. Colin: Hello and welcome to Talking Contact Centers. My name is Colin Taylor. I’m the C.E.O. and Chief Chaos Officer for the Taylor Reach Group and I’m sitting here today with John Cockerill the President of Taylor Reach. Good afternoon John! Colin: We’re going to be speaking about quality assurance and specifically how organizations and contact centers measure quality assurance. Measuring quality and being able to report on the quality of service delivered through a contact center is an integral element of every call or contact center. Colin: Can you set the table and provide us some background on what you have seen in your experience? 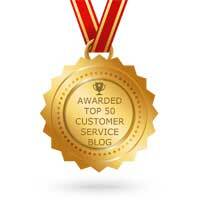 John: All right, call and contact centers often have some form of quality assurance. This takes the form of either a supervisor looking at and listening to the calls and reporting to the agents and providing some form of context to them as to how to do their job better. It gets a little bit more complex and nuanced when they start to actually record what those observations are in some form or other, and then devolves even further as they might consider some form of outsourcing. Whether or not that report is used for anything other than coaching and showing the agent what they would like is part of the topic of this conversation. Colin: Often times, as you imagine, we see structures created within the contact center to evaluate the calls. These are most commonly forms which go through the attributes or the call elements or even the specific verbatims that they want the agents to be addressing. When the quality is being evaluated by somebody who is in the program, for example the supervisor, who works closely with the staff, who we would reasonably assume is more knowledgeable and more educated about the program itself, about what the organizational goals and objectives and about the clients and the clients’ perceptions, perspectives and what the callers are trying to attain out of the process. This can work very well, but we know supervisors tend to have a large litany of things on their plate and when push comes to shove, quality is one of the things that gets dropped and can lead organizations to consider outsourcing this function. The most common way of outsourcing – offloading this activity, is to send it to a quality assurance team. Now, those quality assurance teams can be resident in the center or even centralized elsewhere in the organization. John, what are some of the challenges around the centralization of that activity? John: Even at the supervisor level, one challenge that is raised is a perceived lack of fairness, agents may say, “Well, my supervisor is prejudiced against me in one form or another.” One way of avoiding that type of perception is to move it to somewhere else in the department or organization where all they are doing is the quality assurance and they do not have a direct relationship with the agent. Colin: Which gives the illusion of being more impartial, which may or may not be in fact the case. John: That’s correct. From there, people have then moved quality outside of the organization completely too either somebody unrelated in the organization, or even to third-party operations. Colin: So, a centralized quality team in the head office may be more objective in assessing any of the individual calls but will lose the context of the deep connection with customer and with the project or campaign objectives. If we go outside the organization, if we look at this as an outsourced type of an application, those challenges remain. There is more impartiality perhaps but there is less context and less understanding of the milieu in which the center operates. We’ve seen that drive some separation in organizations between what I’ll term quality and compliance. Now, as we look at those two, compliance tends to be those yes or no elements that you must do or must avoid doing on the call and those may in fact today be something that is listed on the monitoring form or the quality assurance form, but they can be such things as: did we mention the customer’s name, did we confirm that we had solved their issue, did we ask if there was anything else we could do to help them and maybe a disclaimer requiring a verbatim statement. These can be assessed by anybody anywhere without context of understanding deeply the client objectives, the client perspectives, the organizational goals, etc. These are simple yes and no questions and if we can factor those elements out of the quality process we can then look at quality purely from a perspective of how we can better coach the agents or how to coach the agents to be better at what they do, all focusing on the customer experience and customer satisfaction, this approach can yield some very interesting results. We’ve seen a number of clients in the recent past who have moved to this type of separation to allow them to leverage external resources or offshore resources to create a compliance score while relying on local knowledge-based evaluations of the actual quality and coaching. John: One of the challenges, which we have discussed is in separating out those compliance issues from the quality issues, what is the aim of your quality assurance program? Is it to assure the overall quality of the transaction set or is it simply to be able to improve the general performance of your agents? If it’s to improve the general performance of the agents, your reporting is often focused strictly on the agent side of the business. Susy has done remarkably well this month and she is up a little bit in this area, she is down a little bit in that area. One of the things that you want to be able to look for, at least from an outside observer, is I know that there is going to be change in my agents over time. So if we have got a 100-agent call center, we know that 20% of those agents will rotate or turnover, over the course of the next year. The center score may not change but you want those new agents to be able to come up in performance. By the same token, as a director for a center, you do not really care about any of the individual agents’ performance, you care about the overall performance of the center and how are you doing by individual transactions. Colin: So at the director level it is more about the overall performance but as a supervisor, or from a Q.A. lead perspective it is about the individual agents. Colin: Quality about what elements did we see identified in the call. What moments of truth can we help agents improve their delivery on, how can we better meet the needs of the caller, our customers, and how can we enhance the overall quality. So, as we look at the big picture, as you had mentioned a moment ago, and the impact of attrition that really leads us into a whole other discussion around speed to green or speed to competency which we will take up in another session. Thank you very much John, appreciate your contribution this today. Thank you all for watching. Have a wonderful day and we hope you will join us again soon on Contact Center Talk. Thank you. The above interview was originally presented as a video and may be viewed here. To find out more about how Taylor Reach can help your company with Quality Assurance, CLICK HERE to schedule a free consultation.